Some people seem to end up in the wrong place at the right time. During my time working at the Observer-Dispatch, I had a knack for ending up in the right place at the right time, which sometimes lead to a great story. Back in August of 1993 I was assigned to photograph the events surrounding the disappearance of 12-year-old Sara Anne Wood. Those first few weeks of the search, I spent much of my time in Litchfield driving throughout the area and hanging around outside the command post. I wanted to be there ready to roll if any big news happened. I had become friendly with the commander of the post, Capt. John Wood. (No relation to Sara) He had my phone number and always promised me that I would be on his list of people to call when and if the story broke. A few weeks into the investigation I was home on my day off. My phone rang. It was Capt. Wood. All he said was “Be on the corner of Hacadam and Roberts Road in 20 minutes,” and he hung the phone up. My heart started pounding because I thought I was being handed a “scoop” related to the search. I grabbed my photo gear, hopped in the car and drove like a madman. I pulled well on to the shoulder at the side of the road, got out of my car and turned 360 degrees to find not a soul in sight. After 10 minutes of waiting at the side of the lonely, country road with my gear at my feet, and looking around for any sign of life, I started wondering if I got there too fast…or too slow. An old, beat-up farmer’s pickup truck with wooden panels on the left and right side rolled up. In the back, sitting, standing, kneeling and smiling was a group of the hottest, plain cloths, New York State Police Mobile Response Team (MRT) guys you could ever imagine. When I say hot, I mean these dudes looked like they walked out of a pinup calendar for hot looking cops. They were wearing t-shirts, camo pants, NYSP ball caps, hot dude sunglasses, and a couple even had guns strapped to their thighs. They were every girl’s dream… the bad boys of law enforcement. I stood there, with my mouth hanging open trying to figure out what was happening. Before any words were exchanged between us, the group in the bed of the truck looked at the puzzled, yet dazzled, expression on my face and burst out laughing. They waved me over, grabbed my gear from me and held out a hand to help pull me up into the back of the truck, all while still sporting big, mischievous grins. I asked where we were going and got no response, just smiles. We drove to a farm and the truck turned on to a bumpy, dusty, dirt road that weaved in and out of a corn field. 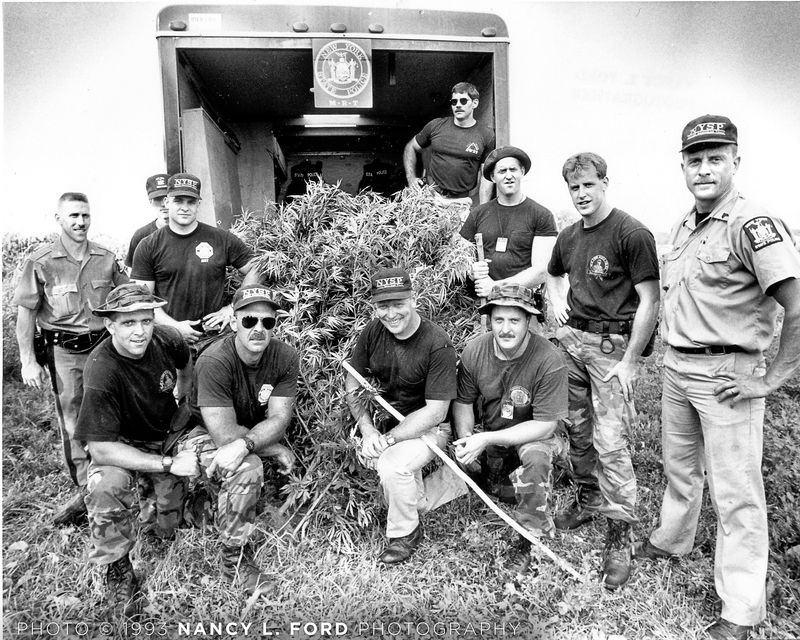 It came to a stop at the crest of a hill next to a NYSP MRT van that was overflowing with freshly harvested marijuana. Still, with no words coming out of my mouth, I looked beyond the van into a small valley and could see a line of troopers coming out of the woods with reams of marijuana slung over their shoulders as they headed up the hill to the van. I felt like I was just dropped into the middle of harvest day in Columbia. Surreal was an understatement. After taking “official” photos of the “harvest” to turn in to city desk, the MRT guys asked if I could take a photo of them with their “catch of the day” for their own personal use. Of course I would. I did not tell any of them where to stand or how to pose, but I had the feeling they had done this before. Without any direction, they gathered around the heap and each struck a pose. I couldn’t have arranged them any better. It just turned out to be the perfect pose.